The final panel testifies at adjudicative hearings on the Northern Pass transmission project before the Site Evaluation Committee in Concord. Left to right they are Max Stamp, Gretchen Draper and Barry Draper from the Pemigewasset River Local Advisory Committee. CONCORD — Wetlands disturbed during construction of the 192-mile Northern Pass transmission line may never be restored to preexisting conditions, the Site Evaluation Committee was told Thursday. The developers have not provided site specific plans to restore more than 800 wetlands that will be disturbed by construction, he said, noting an inventory needs to be done before beginning work. Without the inventory listing wetlands’ values and functions, restoration work may be counterproductive, Lobdell said. The inventory work should have been done before now to truly assess wetland impacts and if the project is approvable, he said. The attorney for Northern Pass told two wetlands experts during the last day of testimony for adjudicative hearings, the state Department of Environmental Services has approved the $1.6 billion project and set conditions that must be met. But both Lobdell and Rick Van de Poll, a wetlands expert hired by Concord, said they disagreed with the decision and that the firm hired by Northern Pass to document wetlands failed to either find all wetlands or properly evaluate their value. Attorney Tom Pappas, representing Counsel of the Public, noted that Normandeau Associates was hired by project developer Eversource to do environmental engineering work. He asked Lobdell if he had concerns about missed wetlands or failure to properly value wetlands, noting the company found only 2 percent were of high value. Lobdell said the company used a points system to value wetlands when a wetland may have just one function but that function is extremely important. Under Normandeau’s system, he said, that wetland may not be important. He said the company’s system did not focus on the rationale on what is the function and value of the wetland. Although he could not quantify how many wetlands are high value along the 192-mile route, he said, it is far higher than 2 or 3 percent. If the wetland’s value is high, then the attempt to avoid, minimize or mitigate should be greater, he said. Lobdell was concerned construction impact to wetlands may extend beyond the boundary if the area is not all within the right-of-way. Van de Poll identified 38 wetlands or vernal pools that Normandeau did not designate in Concord, visited six sites and found five of those were wetlands. 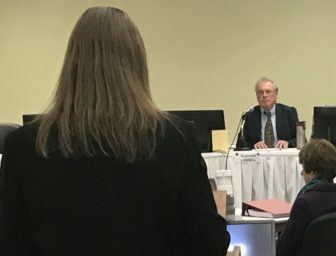 Society for the Protection of New Hampshire Forests attorney Amy Manzelli questions wetlands scientist Raymond Lobdell at Thursdays’s Site Evaluation Committee’s adjudicative hearing on the Northern Pass Project. Attorney Jeremy Walker, representing Northern Pass, questioned the methodology Van de Poll used noting he used infrared photos to determine areas where there could be wetlands. He said Normandeau provided detailed maps of far greater definition, but Van de Poll said he used the photos as a starting point. Walker used as an example a site off Sanborn Road in the utility right-of-way noting Van de Poll believed two wetlands were connected which would involve a construction pad, but determined in a later visit that is not the case. Van de Poll said he was not hired to do that and it would be inappropriate. But Walker said without maps and boundaries, it is hard to compare his work with Normandeau’s. Van de Poll said the information he provided is sufficient to to determine if his findings are correct. He noted Concord’s attorney invited Northern Pass’s experts to visit sites he found that were not on their maps, but they did not. Walker asked if Van de Poll asked if the Department of Environmental Services decision allayed his concerns about sufficient monitoring to assure impacts are mitigated, and Van de Poll said those are standard protocols in all permits. Committee member Craig Wright, the DES representative on the Site Evaluation Committee, asked why he feels that way. 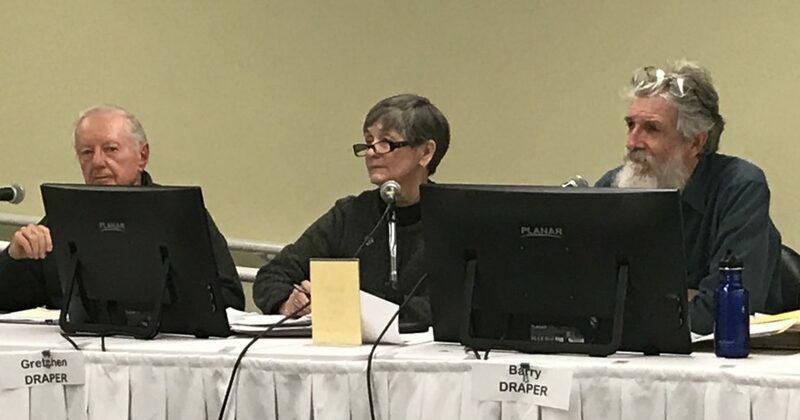 “I’ve been involved in DES approved permits for over 30 years,” Van de Poll said, noting one problem has been invasive species and continued monitoring over a three-year period. Invasive species are “vigorous,” and invade many restoration sites that are not protected and the DES is responsible for those permits, he said. Van de Poll said the Karner Blue Butterfly protected area includes three other endangered species not acknowledged in the permit. Wright asked if his concern was monitoring or not mitigating, and Van de Poll said both, noting if the same amount of wetlands were missed along the entire route as were in Concord, there would be a considerable amount of temporary and permanent impacts not accounted for and factored into the mitigation plan. He noted when he visited the sites in Concord, none of the wetland boundaries were flagged. Is that the usual practice, asked Christopher Way, representing the Department of Business and Economic Development. Van de Poll said typically when he is asked to review existing wetlands, in all cases he found flags in the field. Others testifying Thursday were concerned about the DES’s ability to monitor all construction work. “The DES has other jobs to do,” said Gretchen Draper of the Pemigewasset River Local Advisory Committee. She said an independent monitor is needed. Three members of the advisory committee made up the final group to testify during the adjudicative hearing. Attorney Barry Needleman, representing Northern Pass, went over discussions between Plymouth officials and project representatives. He said the project proposed three alternative routes for the buried line that would go along Main Street, a state road. But selectmen wanted to wait until a meeting with town residents on the project, Needleman said. After that meeting, he said, the selectmen cut off discussion and he showed a video of the selectmen’s meeting. Town land use and planning director Brian Murphy said the Main Street route was the one Northern Pass preferred. She asked if town meeting had passed a warrant article on Northern Pass and he said it had unanimously passed one opposing the project and suggesting it go down Interstate 93. The committee is expected to close the record on Northern Pass on Friday afternoon. The committee will begin deliberating at the end of January with a decision by the end of February.